Since 2011, teaching visual literacy has been one of the strategic objectives of the Toledo Museum of Art (TMA), site of the 2014 International Visual Literacy Conference. In an effort to realize this objective, the museum established an institutional definition and framework for Visual literacy, created a twelve-hour introductory curriculum, and implemented it across the museum. This paper will give an overview of the visual literacy definition and framework employed by TMA, describe the pedagogical approach utilized by TMA educators and docents, and examine implementation of the curriculum through case studies of four of the museums core audiences: schools and teachers; general museum visitors; private sector partners; and museum staff, docents and volunteers. The case studies examined will focus on adaptation strategies employed to meet the unique needs of these distinct audiences. The article will also address ongoing evaluation efforts. To provide some context, since 1901 the museum has been dedicated to its purpose of art education. The museum has consistently cultivated innovative programs and curriculum; since its creation, the institution has offered some form of classes and hands-on instruction. By the 1930s the museum had established a comprehensive range of “tours, illustrated lectures, forums on current exhibitions, and talks which relate art to the subject matter of elementary and secondary schools” (1935). The popularity of the museum’s art classes for children reached new heights in the years following the Second World War and have remained a cornerstone of the museum’s offerings ever since. The Studio Glass Movement, originating at TMA in the 1960s, and the museum’s Family Center, established in the 1990s, also served as important milestones in the institution’s educational journey. 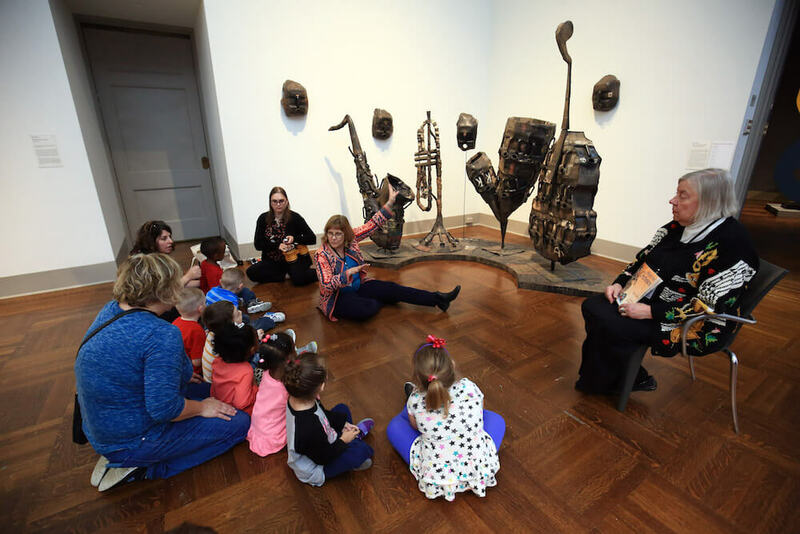 Most recently, TMA’s Baby and Toddler Tours have expanded the museum’s efforts to bring art education into the lives of the youngest members of the community. Building upon this foundation, TMA’s Visual Literacy Initiative carries on the museum’s legacy of commitment to innovation in the field of art education. This article is an overview of the development, implementation, and evaluation of visual literacy curriculum at TMA. The following pages will outline the visual literacy framework developed at TMA, describe the pedagogical approach employed, and provide case studies of how the curriculum has been implemented for four core audiences: internal audiences (museum staff, docents, and volunteers), the education sector (schools and teachers), the general public, and private sector partners. Ongoing evaluation efforts will also be addressed. At TMA visual literacy is defined as the ability to read, comprehend, and write visual language. Reading visual language is fundamentally concerned with vision. Comprehending visual language is fundamentally concerned with cognition, in other words the interpretation of what is seen. And writing visual language is fundamentally concerned with action. Because the process of ‘writing’ is bound up with cognition, visual literacy can be thought of as a form of critical thinking. Visual literacy is more than what we see, it also investigates the way that we see, that is the biases and preconceptions that color our individual interpretations of images, and in that way can be thought of as a form of metacognition. What Does it Mean to be able to Read and Write Visual Language? As an institution, TMA teaches visual literacy through three core components: the Language of Art; the Art of Seeing Art: Learning to Look; and the Four Visual Languages: Form, Symbols, Ideas, and Meaning. The first, and most fundamental component is the Language of Art, which is the development of visual vocabulary as a means of objectively describing an image. As a fine arts organization, it is logical to draw on the established visual vocabulary, the Elements of Art and Principles of Design. 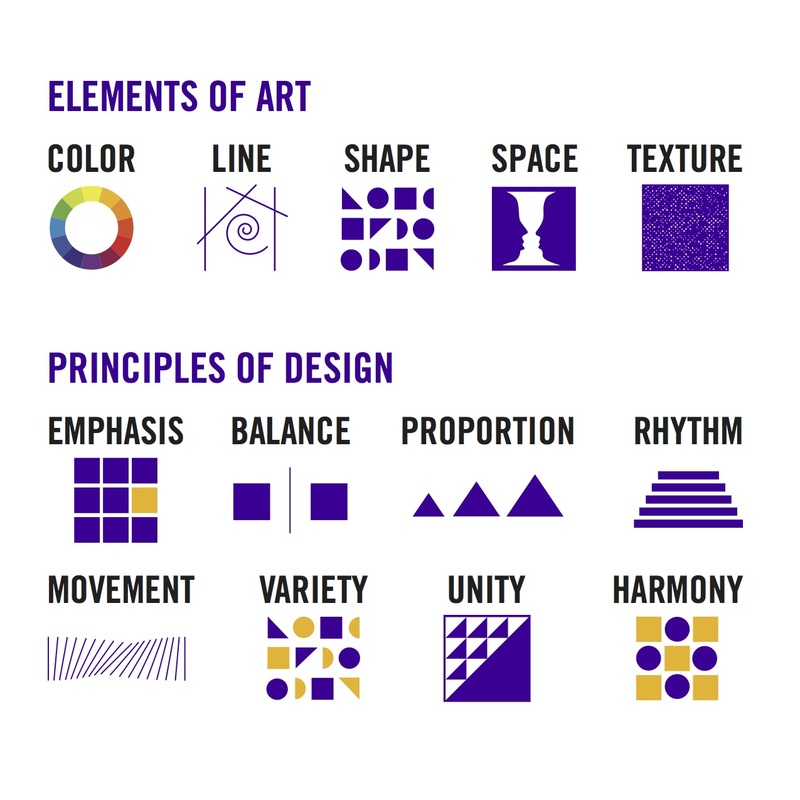 There are five Elements of Art and eight Principles of Design, defined in Figure 1 below. [iii] Using this vocabulary to describe images allows an observer to work toward an impartial and subjective description what is being seen. 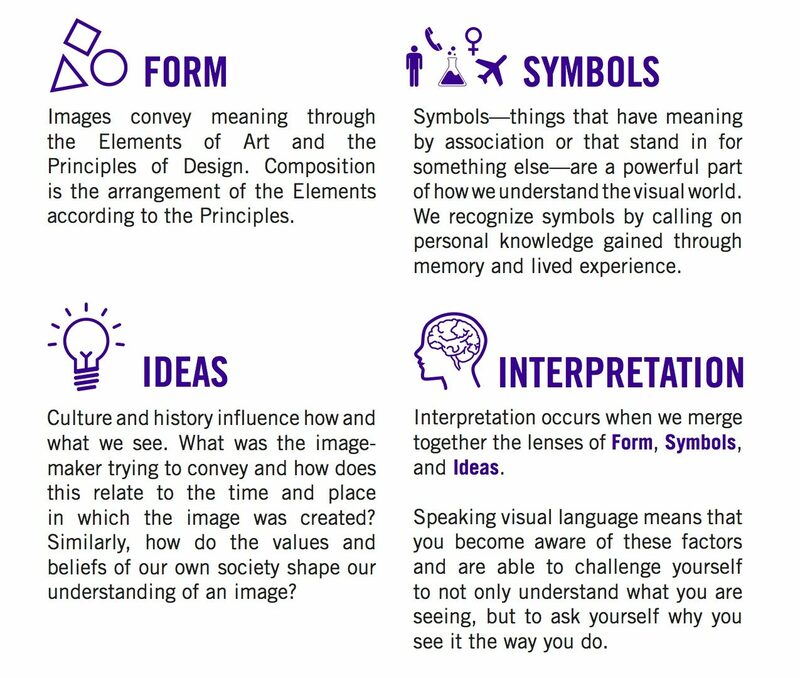 The second component is a six-step process called the Art of Seeing Art, developed in collaboration by TMA educators and curators for interpreting images (see Figure 2). By following this process, an individual will become equipped with the tools necessary to comprehend the significance of the forms, ideas, symbols, and meanings that inhere or arise from any given image. There are six steps in the ‘Learning to Look’ process: Look, Observe, See, Describe, Analyze, and Interpret. The first three steps—Look, Observe, and See—are the steps by which one ‘reads’ visual language. Looking is akin to skimming. In this step, the viewer quickly surveys the image and takes in visual information. Observation is an active process, requiring both time and attention. Seeing uses the observations to create a mental inventory of all of the image’s visual elements. The second three steps—Describe, Analyze, and Interpret—are the steps by which one ‘writes’ visual language. ‘Describe’ is used to name the Elements of Art and Principles of Design in relation to the catalogue of visual elements that he or she has created. During analysis the viewer begins to identify the objects/entities that are present within the image. Ultimately, the viewer arrives at interpretation by applying the four Visual Languages (see Figure 3). It is important to note that ‘Learning to Look’ is a cycle; a viewer returns to looking after he or she is done interpreting. 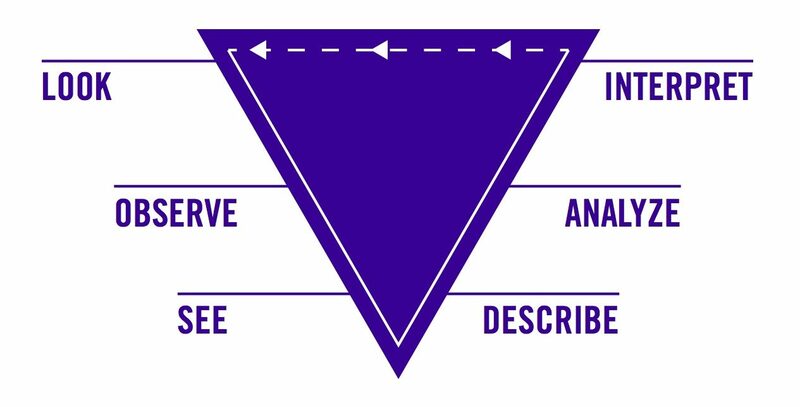 The final component of the visual literacy framework developed by TMA is comprised of the four visual languages. These visual languages are the result of efforts by TMA educators and curators to translate the academic disciplines of Art History, Semiotics, Ideology and Hermeneutics into a form which is more easily accessible to the general public. Studying the visual languages enables viewers to become fluent in interpreting images through four distinct methods (or lenses): Forms, Ideas, Symbols and Meaning, which are defined in Figure 3. Taken as a whole the Language of Art, Art of Seeing: Learning to Look process, and Four Visual Languages are the Visual Literacy framework used at TMA to teach Visual Literacy skills. There is a high degree of interrelation between the three components of the framework, for example, a strong command of visual vocabulary is an essential tool for describing, step four in the Art of Seeing process. The framework is also scaffolded in structure. By this I mean that, although all audiences, to a degree, engage with analysis and interpretation, lessons for novice viewers focus on the Language of Art and Art of Seeing process, while more sophisticated viewers are challenged to engage more deeply with interpretation through the Four Visual Languages. Museums have the power to provide rich and meaningful informal learning experiences for a wide range of audiences. To maximize the effectiveness of these educational experiences, museum teaching should be steered by a clearly defined set of pedagogical practices. At TMA five key pedagogical principles guide the development and delivery of curriculum, which are: activity-based instruction, multi-modal engagement, gamification, audience focused design, and content agnostic curriculum. At TMA, we are lucky enough to have 366,732 square feet of gallery space to use as visual literacy classrooms. From the outset it was important to utilize this space and the works of art it contained in a purposeful and intentional way. Building on Dewey’s (1934) conception of “art as experience,” visual literacy workshops at TMA are designed to engage participants in learning through doing. Based on a model of experiential learning that views learning “as a process whereby concepts are derived from and continuously modified by experience” workshop activities are sequenced to encourage participants to move through four modes of experiential learning. Typically workshop activities begin with a hands-on learning component (concrete experience), followed by peer-to-peer sharing (reflective observation), facilitated discussion (conceptualization), and implementation (active experimentation) (Kolb, 1984, pp. 26, 30). Visual literacy workshops at TMA endeavor to teach people skills they can use to see better; they use a multi-modal, multi-sensory approach to do so. Accepting both the need for a multi-modal understanding of visual texts and the theory of Multiple Intelligences suggests that gallery teaching can (and should) engage multiple learning styles in order for a diverse audience of participants to best attain deep learning (Gardner, 1983; Kress, 2010). For an example of this, consider the curriculum dedicated to the Visual Language of Form. In this module multi-modality is demonstrated through the combination of activities which as a body include kinesthetic activity, small group work, drawing, peer-to-peer sharing, and facilitated discussion. Defined as the “use of game design elements in non-game contexts,” gamification is employed in the curriculum as both an engagement and learning strategy (Deterding, Dixon, Khaled, & Nacke, 2011). Specifically, the TMA curriculum employs three of James Paul Gee’s (2005) principles of good learning: well-ordered problems, pleasantly frustrating challenges, and “just in time” information. These strategies are useful for designing activities which are fun and engaging while simultaneously promoting deep learning. Well-ordered problems in this context speaks to the sequencing and scaffolding of visual literacy concepts in a way that begins with the most accessible content and builds in complexity. Individual activities are designed to be difficult enough to push participants’ understanding and application of the concepts while remaining within the limits of their competencies, a principle Gee refers to as “pleasantly frustrating.” Finally, because skill development not content memorization is the desired outcome for our workshops, contextual and factual information is reserved and layered into the experience only when necessary to progress the discussion or activity forward (just in time). The participant, not the educator, is at the center of the visual literacy curriculum. Building on Vygotsky’s (1978) theory of the zone of proximal development and accounting for the wide diversity in the cognitive development and visual fluency of museum audiences, visual literacy instruction aims to engage participants by producing learning environments which “permit pupils to learn as agents with their peers’ collaboration” (Yvon, Chiaguerova, & Newnham, 2013, p. 34). This is achieved through an emphasis on peer-to-peer sharing and the incorporation of student choice within activity design. 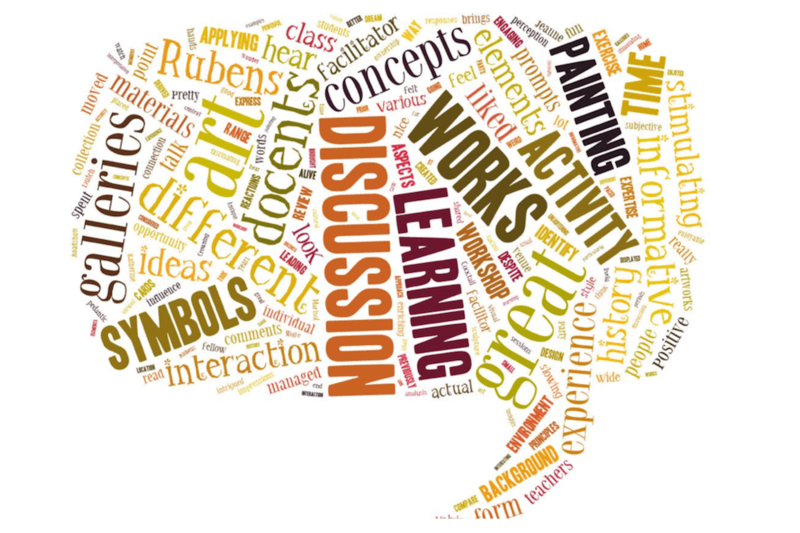 For example, in the Record and Response activity, participants are asked to select an object for study, diagram with interesting aesthetic or functional elements of the work and share their ideas with a partner. Learning in this activity is student and peer driven; the role of the educator is to prompt inquiry and facilitate discussion. The goal of visual literacy instruction at TMA is not to teach participants facts and anecdotes about the paintings and sculptures in the museum collection (although improved comfort viewing and interpreting works of art is an expected outcome), but rather to use the great works of art in the collection to teach participants to become fluent readers of the visual world around them. The curriculum is therefore skills-based and not beholden to any specific subject matter, that is, the activities are equally effective at developing students’ visual literacy skills when used with ancient and contemporary objects from the collection. We commonly use the term ‘content agnostic’ to refer the curriculum’s non-dependence on a specific subject area. One advantage of this principle is that with only slight modifications, the activities designed for the workshops can be applied equally effectively with non-art images. In the Meaning module, participants use a functional object as an object of investigation. The goal of this activity is to provide a site of inquiry through all four of the visual languages and to examine the intersections, parallels, and tensions between these alternate modes of looking. Because the emphasis is on developing skills rather than imparting facts about the object of study, this activity has proven to be equally effective with objects as diverse as: a 19th century oak dining table, a late period Egyptian coffin, and a disposable, plastic water bottle. Using the framework and principles outlined above, a twelve-hour curriculum to introduce visual literacy and our method was developed as the first phase of visual literacy instruction. The curriculum employs the pedagogical principles to introduce the Language of Art, Art of Seeing, and Four Visual Languages through gallery-based activities and facilitated discussions. Comprised of six, two-hour modules the curriculum structure is designed for maximum flexibility to accommodate multiple museum audiences. This curriculum serves as the foundation for visual literacy instruction at TMA from which all future curriculum will build. In this vein, the curriculum team is in a continual process of curriculum development, beta testing, and iteration. Currently, the second phase of curriculum focusing on providing a deeper examination of the Four Visual Languages is being tested for implementation to wider audiences by summer 2016. The remaining portion of this article will examine the application of the curriculum in programs targeting four distinct museum audiences: internal audiences (museum staff, docents, and volunteers), the education sector (schools and teachers), the general public, and private sector partners, as well as outlining our ongoing evaluation efforts. In order for the TMA to be a center for visual literacy, it is imperative that our biggest asset, our people, are equipped to institutionalize and operationalize visual literacy. To accomplish this, museum staff, volunteers, and docents were invited to participate in a series of professional development workshops. These workshops, which were held in a variety of formats in order to accommodate the widest level of participation, were facilitated by the education department and a team of docent leaders. 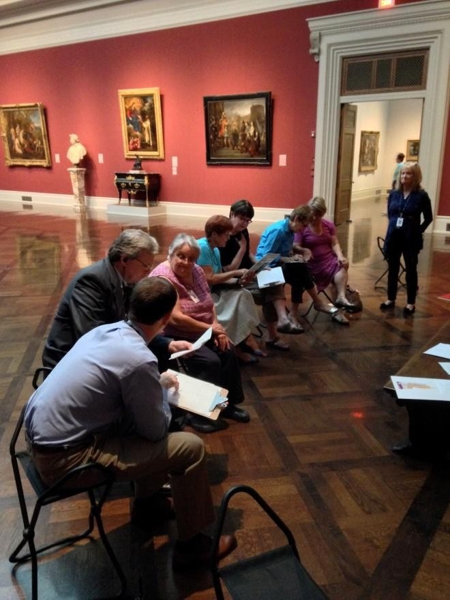 Between May 2014 and August 2015, over 330 TMA staff, volunteers, and docents completed the full twelve-hour workshop. Not only did implementing the curriculum internally give key members of the TMA community the foundation in visual literacy to begin operationalizing it in their day-to-day areas of responsibility and expertise, this also provided an early and in real-time feedback mechanism for refining the curriculum. A series of post-module online evaluations were employed to collect participant input on the individual activities and overall framework. The information collected was regularly reviewed and utilized to adapt workshop content on an ongoing basis. One example of the effectiveness of this strategy is the evolution of the definition of visual literacy itself. At the onset of the workshops the TMA definition was “reading and writing visual language” however, based on feedback from early workshops about the distinct nature of cognition and action as related but separate functions of visual literacy, the definition was amended to “reading, comprehending and writing.” Evaluation data were also used to refine the sequencing of individual activities as well as the overall messaging. We learned the importance of acknowledging the knowledge and experience participants bring to the workshop as a way of framing visual literacy as a positive enhancement of existing skills. Figure 4: TMA staff member engaged in a drawing exercise as part of a staff professional development workshop. Currently we are in the process of institutionalizing the professional development curriculum itself. Beginning in 2016 the workshop will become an integrated component of the new staff orientation process. An early outcome of these efforts has been the development of an initiative between facilities, security, education, and the director’s office to use visual literacy practices to enhance museum safety and security. Last year 23,830 students visited TMA, as a part of over 500 visiting school groups. The majority of these students—over 16,500—participated in a docent-led tour during their visit. Because TMA Docents have been engaged with visual literacy since 2011, and have themselves participated a range of trainings and enrichments on the subject, including the twelve-hour professional development workshop, it is not surprising that they are naturally incorporating visual literacy strategies into the tours they create and deliver. However, in addition to this ad hoc integration, the visual literacy curriculum has explicitly been incorporated into the curriculum of several of the museum’s school programs. Two notable examples are programs developed in collaboration with two of TMA’s school partners: the Toledo School of the Arts (TSA) and Toledo Public Schools (TPS). In both cases not only was visual literacy incorporated into museum visits, additionally, faculty participated in professional development workshops as a means to assist them in incorporating visual literacy curricula into their classroom lessons. These programs demonstrate the importance of the ‘train the trainer’ model and collaborative program development for effective visual literacy curriculum partnerships with schools. As discussed earlier, the visual literacy curriculum utilizes a scaffolded approach, which enables us to modify and adapt the curriculum as appropriate for the audience; only the components of the curriculum that are developmentally appropriate are employed in the program. For example, programs for our youngest visitors focus on supporting the development of descriptive vocabulary by teaching the Elements of Art. Preschool tours are such programs. These tours support classroom pre-literacy skills development through hands-on gallery experiences. The kinds of experiences used in these tours range from drawing to tactile and kinesthetic experiences. During the preschool tour that explores Made in Porto Novo by Romuald Hazoume students listen to a sample of saxophone music, pantomime play an instrument, tap out a percussion pattern on the floor, and feel a sample of textured metal (Figure 5 and 6). These multi-modal experiences are used as opportunities to reinforce targeted descriptive vocabulary. 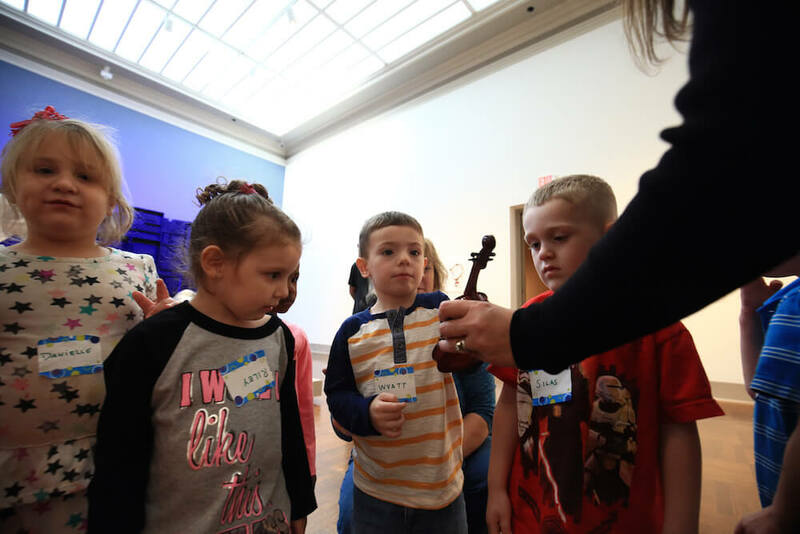 Figure 6: Preschool tour participants handle an object from the Teaching Collection during a gallery experience. Photo credit: Andrew Weber © Toledo Museum of Art. From September through December 2014, TPS and TMA collaborated on a pilot study to measure educational outcomes associated with preschool tours. The study was conducted jointly by TPS teachers and occupational therapists as well as TMA educators and docents, and included eight classes of students from Mayfair Preschool aged between three and five at the beginning of the trial. The purpose of the study was to assess the extent to which pre-literacy skills were enhanced by exposure to visual literacy curricula. Pre-literacy skills were measured by the acquisition of new words. Specifically, tier two vocabulary—that is, words to which the students were unlikely to have been exposed—were introduced through the visual literacy curriculum. Follow-up assessments measured how many of those words were used. Compared with the control group, which added no vocabulary words, the group of students who participated in both museum-led and TPS created lessons, added an average of 4.66 words per student per treatment (across six treatments, this amounts to 28 new words over the course of the study). The results of the study not only suggest that visual literacy intervention has significant potential to positively affect early childhood learning outcomes; it also indicates that the best outcomes are achieved when museum educators and classroom teachers collaborate. Based on the positive results of the 2014 pilot study, the project has been expanded school-wide for the 2015/16 school year. TMA and TSA have an established history of collaboration. In the summer of 2014, faculty from TSA’s English Language Arts, Social Studies, and Humanities departments participated in a one-week professional development workshop hosted by the museum. The workshop introduced TMA’s visual literacy definition and framework, explicitly connected it to the state adopted Common Core Curriculum, demonstrated how our visual literacy curriculum supports critical thinking and transferable skill development, and provided teachers with information about the resources available to them. At the conclusion of the workshop, TSA faculty collaborated with TMA educators and docents to determine how to best incorporate visual literacy into their subject areas. As a result of the workshop, TSA faculty responsible for teaching 10th grade American history, decided to reimagine their existing multi-visit program. TSA and TMA educators worked together to expand the reach and depth of the program to include two additional classrooms and incorporate a series of visual literacy activities designed to challenge the students’ close-looking and critical thinking skills. In another example of collaboration arising out of the summer workshop, a multi-visit program was developed to support 6th and 7th grade Social Studies classes, who were not previously visiting the museum. This program employs the visual literacy curriculum through drawing, ekphrastic writing, and peer-to-peer sharing activities in support of Common Core Curriculum, specifically in support of speaking and listening skill development. The ongoing collaboration with TSA faculty is evaluated through a series of round table discussions which provide an opportunity for real-time feedback. The museum is currently pursuing a project to measure learning outcomes for these programs. Figure 7: Participants engage in small group discussion during a visual language workshop. Visual literacy is implicitly incorporated into the public programs and permanent galleries and special exhibitions enjoyed by TMA’s 400,000+ annual visitors. 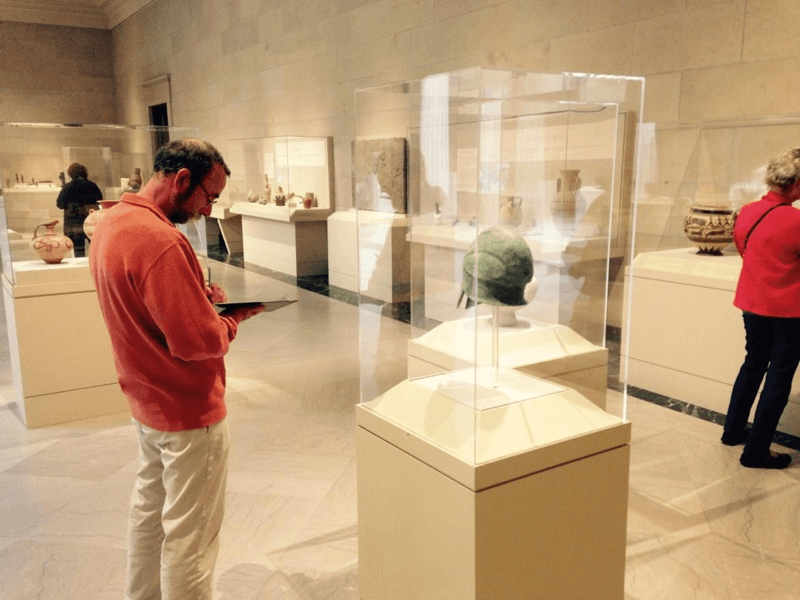 In addition to these efforts, the museum has developed both programmatic and self-guided opportunities for interested visitors to explicitly engage with visual literacy in the museum. In June 2015 the museum began offering a series of free visual language workshops. The two-hour workshops, which are held on Saturday afternoons and facilitated by a specially trained team of docents, focus on providing visitors with an introduction to the Art of Seeing process. Each workshop is gallery-based and takes one of the four visual languages as its subject. During the workshops participants engage in drawing exercises, facilitated discussion, and small group activities around works of art in the collection. Class sizes are limited to eighteen in order to maximize participation and encourage dialogue. In addition to the workshops, TMA visitors can have a self-directed visual literacy experience by visiting the exhibition Speaking Visual: Learning the Language of Art. The exhibition uses works from the Toledo Museum of Art collection to teach visitors methods and approaches for using visual literacy skills to interpret works of art. Co-curated in partnership between TMA’s curatorial and education departments, the exhibition features works of art sampled from across the museum collection. Objects in the exhibition are arranged in groupings to evoke inquiry around core visual literacy concepts. For example, an area of the exhibition concerned with the Visual Language of Ideas, or how context affects meaning, features a pairing of four objects (a Tibetan seated Buddha, an early 20th century Baule pendant mask, an Ancient Greek jewelry horde, and a 13th century gold-ground Madonna of Humility) all united by the use of gold as a central material component. Visitors are encouraged to consider how the material and its visual properties evoke differing meanings as the context of cultural production shifts. The works of art in the exhibition are augmented through a series of didactics designed to ignite inquiry and conversation as well as hands-on activity stations which engage visitors to explore the concepts through play and experimentation. First installed in October 2014, Speaking Visual reopened in an expanded format in summer 2015 and will remain on view into 2016. For the past three years, employers who recognize the value of a visually literate workforce have been partnering with TMA to offer professional development training for their management staff. These partners comprise a wide range of industries from the medical field to retail, recreation, and manufacturing. Through these partnerships, participants from the field of Environmental Health and Safety (EHS) have expressed particularly strong resonance with the curriculum. TMA has been working closely with the EHS management team from a Toledo-based, Fortune 500 firm to explore the implications of visual literacy skill development for improving safety in the manufacturing environment. In particular, the corporation’s EHS officers appreciate the relevance of visual literacy skills in relation to hazard recognition and incident investigation. EHS trainers and managers from across the organization have participated in a series of one-day visual literacy workshops held in the museum galleries and classrooms. 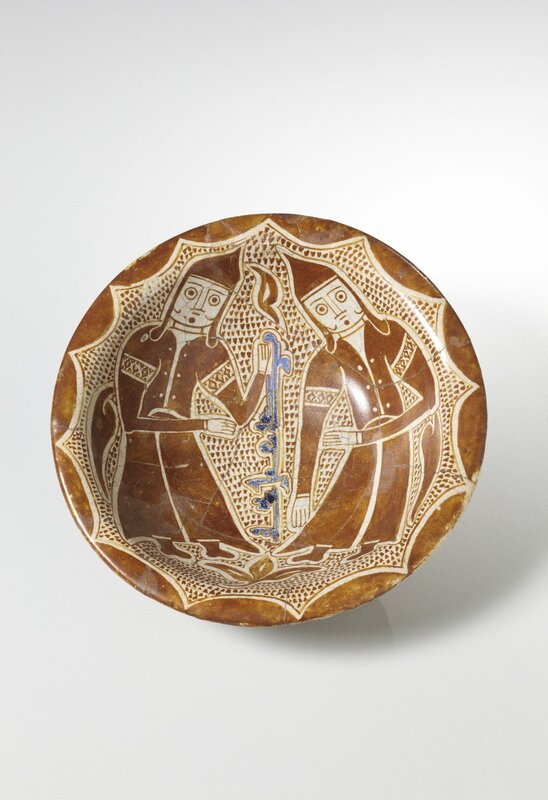 Figure 9: Abbasid, Iraq (possibly Baghdad), Bowl, early 10th century. Samarra ware, earthenware with gold luster and blue over glaze, Diam. 8 1/2 in. (21.6 cm). Toledo Museum of Art (Toledo, Ohio). Purchased with funds from the Libbey Endowment, Gift of Edward Drummond Libbey, 1941.23. Activities for these workshops are selected from the visual literacy curriculum for their ability to help participants recognize the existence and effect of visual bias. One particularly effective exercise for illustrating the ways in which the same image can be seen very differently is called back-to-back drawing. In this exercise, participants are paired up into describing and drawing roles. ‘Drawers’ must recreate a work of art that they cannot see based on the verbal descriptions provided by their partners. During one workshop, a ‘describer’ working with a 10th century Islamic platter gave information about a pattern of upside-down ‘u’s on the lip of the vessel (Figure 9). Her partner interpreted this by drawing a ring of upside-down ‘ewes.’ During the group debriefing following the activity the pair discussed the slippery nature of language and challenge of applying precise language to visual information. The success of these early workshops has led to the expansion of the program in an effort to operationalize visual literacy by integrating it into existing safety training and certification programs. Additionally, as a result of our work locally, TMA was invited in the fall of 2015 to present a visual literacy workshop at the Campbell Institute during the National Safety Council’s annual conference. During this three-hour workshop, TMA facilitators led over 125 EHS leaders from the nation’s largest employers in visual literacy exercises. During the discussion at the end of the session, these health and safety leaders returned repeatedly to the value of visual literacy for illuminating hidden visual biases and vulnerabilities, that is, the ways that visual literacy can make the unseen, seen. 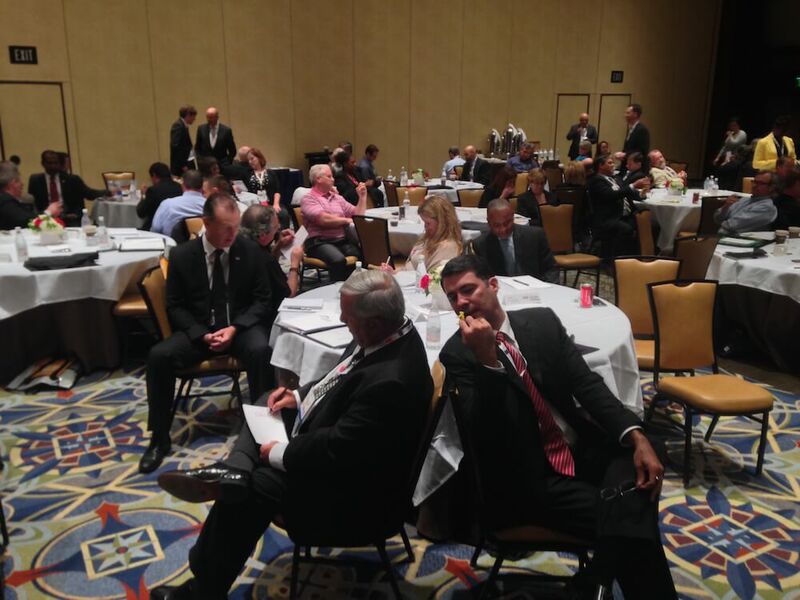 Figure 10: Executives participate in a drawing exercise as a part of the Campbell Institute executive summit. As is a combination of curriculum, exhibition strategies, and programs that reach diverse and multi-faceted museum audiences, TMA’s visual literacy initiative is a multi-layered effort to teach our community how to read and write visual language. In the preceding pages I have provided an overview of the development, implementation, and evaluation of visual literacy curriculum at the TMA over the past five years. The case studies demonstrated the applicability of the TMA Visual Literacy framework across a broad—but not all-inclusive—swath of TMA audiences. These provide only a sampling of the visual literacy programs offered at the museum. Because TMA operates on a plan, implement, and evaluate cycle, the visual literacy initiative is very much an active and evolving enterprise; the projects I have outlined are ongoing and developing. Promising early evaluation data indicate the need for further evaluation and the continued development of collaborative partnerships in the field both locally and further afield. Barthes, Roland. (1993). Mythologies. (A, Lavers, Trans.). London: Vintage. Berger, John. (1972). Ways of Seeing. London: BBC and Penguin Books. Deteriding, S., Dixon, D., Khaled, R. & Nacke, L. (2011). From Game Design Elements to Gamefulness: Defining “Gamification”. MindTrek ’11, September 28-30, 2011, pp. 9-15. Dewey, J. (1934). Art as Experience. New York, NY: Minton, Balch & Company. Frey, Roger. (1937). An Essay in Aesthetics. Vision and Design. Harmondsworth: Pelican Books. Gadamer, Hans-Georg. (1976). Philosophical Hermeneutics. (D. Linge, Ed. And Trans.). Berkeley, CA: University of California Press. Gee, J. P. (2005). Learning by Design: Good Video Games as Learning Machines. E-learning, 2(1), pp. 5-16. Geertz, Clifford. (1973). The Interpretation of Cultures. London: Faber and Faber. Gombrich, E. H. (1989). The Story of Art (15th ed.). Oxford: Phaidon. Howells, R. & Negreiros, J. (2012). Visual Culture (2nd ed.). Malden, MA: Polity Press. Kolb, D. A. (1984). Experiential learning: Experience as the source of learning and development. London: Prentice-Hall. Kress, G. (2010). Multimodality: A social semiotic approach to contemporary communication. New York, NY: Routledge. Lidwell, W., Holden, K., & Butler, J. (2010). Universal Principles of Design (2nd ed.). Beverly, Massachusetts: Rockport Publishers. Panofsky, Erwin. (1972). Studies in Iconology. New York, NY: Harper and Row. Peirce, C. S. (1991). Peirce on Signs: Writings on Semiotic. (J. Hoopes, Ed.). Chapel Hill: University of North Carolina Press. Saussure, Ferdinand de. (1959). Course in General Linguistics. (W. Baskin, Trans.). New York, NY: Philosophical Library. Toledo Museum of Art (1935). The Museum Educates, pamphlet. Toledo, Ohio. Vygotsky, L. S. (1978). Interaction between Learning and Development. Readings on the Development of Children. (M. Guavain & M. Cole, Eds.). New York, NY: W.H. Freeman. pp. 34-40. White, Alex (2011). The Elements of Graphic Design. New York, NY: Allworth Press. pp. 81–105. Whiteley, Nigel. (1999). Readers of the Lost Art. Interpreting Visual Culture—Explorations in the Hermeneutics of the Visual. (I. Heywood and B. Sandywell, Eds.). London and New York: Routledge. Yvon, F., Chiaguerova, L. A., & Newnham, D.S. (2013). Vygotsky under debate: Two points of view on school learning. Psychology in Russia: State of the Art, 6(2), doi:10.11621/pir.2013.0203. [i] For more on why TMA has adopted Visual Literacy, our early initiatives, and the vislit.org website see: Kennedy, Brian (2015). Do You Speak Visual? : Why it’s essential to teach visual literacy. Museum, May/June 2015, pp. 22–25. [iii] Because there is no universally accepted list of Elements of Art and Principles of Design in the Visual Literacy scholarship, the Elements and Principles taught at TMA were determined through group consensus during cross-departmental discussion. For an examples of the variation of lists in contemporary practice see: The J. Paul Getty Museum (2014), Lidwell, Holden, and Butler (2010), and White (2011).